The conversations between your customers and agents contain invaluable insights—if you have the right tools to easily interpret and act on this dialogue. Unfortunately, most organizations waste time manually mining only a subset of customer interaction data, or worse yet, do nothing with it at all. Speech analytics is an incredibly powerful tool for contact center leaders. It easily delivers real-time visibility into the full customer journey and agent responses, which are essential for driving higher customer satisfaction and business success. 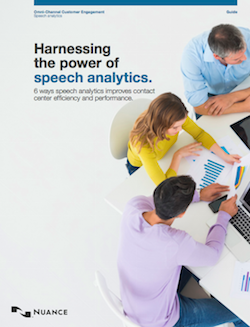 Speech analytics is your key to transforming customer data into better business outcomes.